Imagine that you could survive for months absorbing sunlight the same way plants do it. That would be really cool if you think about it, no more starvation. For many years, this idea was considered impossible or even absurd due to the fact that plants and animals have a very different biological mechanism. However, scientists have discovered a creature that could borrow genes form algae and incorporate them into its cells to mimic some plants’ vital functions. The most advanced form of survival would be eating plants and become photosynthetic. 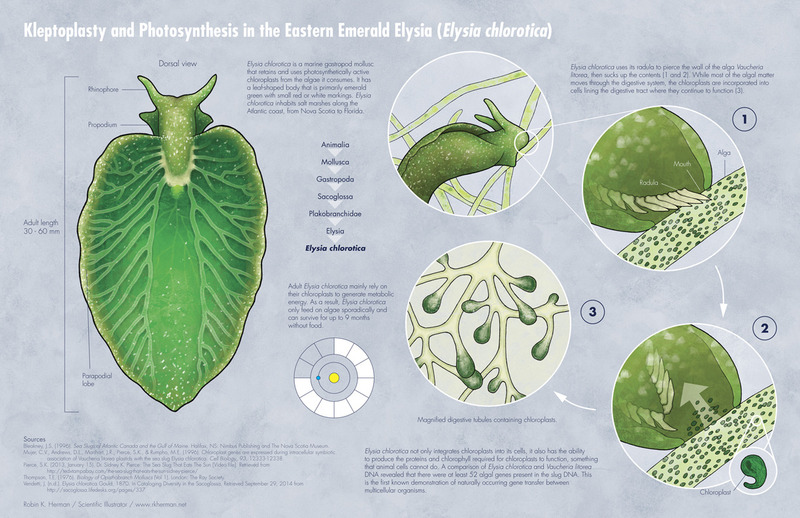 Let’s take a look at the animal that has this kind of super powers, the Elysia Chlorotica. This animal is a lurid green sea slug, with a gelatinous leaf-shaped body that lives along the Atlantic seaboard of the US, but what sets it apart from most other sea slugs, is its ability to run on solar power. 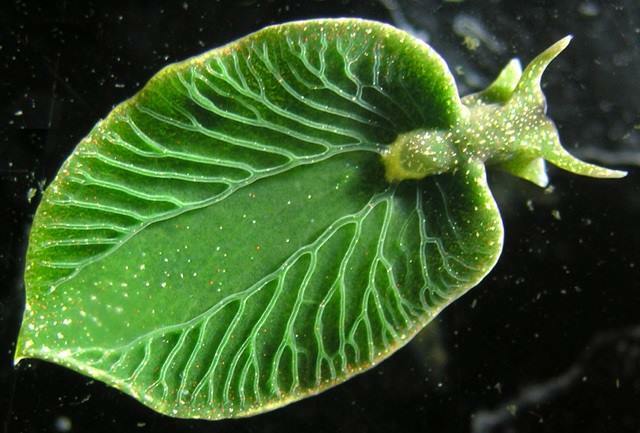 Mary Rumpho of the University of Maine, is an expert on E. chlorotica and has now discovered how the sea slug gets the ability to photosynthezise just like a plant. We have known for some time that an alga is a super food for both plants and animals. 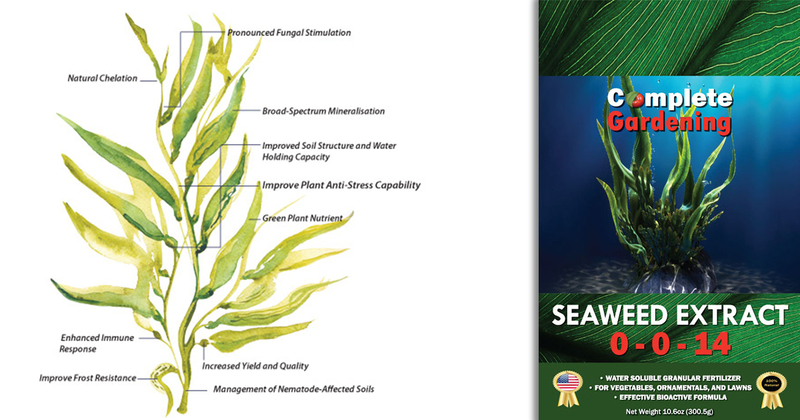 Its properties can easily be transferred to improve plant’s structural functions, health, growth, flowering, and much more. How does the Slug do the trick? Young E. Chlorotica fed with algae for two weeks and could survive for the rest of their year-long lives without eating. But, is this possible? Chloroplasts only contain enough DNA to encode about 10% of the proteins needed to keep themselves running. The other necessary genes are found in the algae’s nuclear DNA. “So the question has always been, how do they continue to function in an animal cell missing all of these proteins,” says Rumpho. The answer: They get the genes from the alga they feed from and incorporate them within its own cells along with the chloroplasts (Cells responsible for photosynthesis). That’s really awesome! The X-men of the animal kingdom. The researchers believe many more photosynthesis genes are acquired from the alga, but still need to understand how the plant genes are activated inside sea-slug cells. Now, What about a transfer from Alga to Plants or Alga to Humans? Liverpool University, Professor Greg Hurst, says that DNA jumping from one specie to another is not rare. However, despite the fact that that species can transfer their own genes to a different one, the DNA does not appear to function in the new species. BUT, What if this is possible to a certain degree? Scientists have found that when plants are fed with algae derivatives, they tend to develop certain characteristics. For example, when an alga’s derivative is applied to the plant’s root system, the entire rhizosphere tends to grow in proportions that surpass any other plant grown under normal circumstances. It increases plant’s immune system; improves size, leaf formation, flowering stages, flavor, and aromas. The benefits of Algae are beyond imagination for both humans and plants, and we still don’t know much about it. But what we do know is that it works, and you should be using it. Other animals are able to harness sunlight after eating plants, says Mary Rumpho, but this is only because they acquire the entire plant cells, which is very different to transforming an animal cell into a solar-powered plant-animal hybrid. It is unlikely that humans could become photosynthetic in this way because our digestive tract system just destroys all that stuff up including the chloroplasts and the DNA. The sea-slug phenomenon might be a piece of evidence that demonstrate that gene transfer can occur to a certain degree between species.Some cases are perceptible and amusing, like the slug that can transform his own body into a solar panel for survival, and also can transfer its biological adaptation to the next generation. But, what about those changes that can occur, but are not perceptible to the naked eye? This is one of the reasons why GMO is so controversial. We are going to talk about this topic in our next article, but I am going to leave some insights about this phenomenon that lately, nobody seems to pay much attention. A GMO (genetically modified organism) is the result of a laboratory process where genes from the DNA of one specie are extracted and artificially forced into the genes of an unrelated plant or animal. This technique that uses genetic engineering is highly mutagenic. This can cause unpredictable changes in the DNA and the proteins produced by the GMO which lead to toxic or allergic reactions. If plants and humans can absorb properties from the things that both species consume, stay away from GMO. From where I come from, the elders used to say that “Wherever you go, pay close attention to the food because people are what they eat.” I apply the same principle on myself and also to my plants. I just feed them with the best stuff I can find and I make sure they have a healthy and powerful development. Previous Post: Do you want Sweeter, Bigger, and Tastier BUDS? Next Post: GMO products can transfer bad DNA into your plants and body.